US: The Democrats massive fail in trying to overturn suspension of immigration from only 7 Muslim countries……. – The Tundra Tabloids……. US: The Democrats massive fail in trying to overturn suspension of immigration from only 7 Muslim countries……. DESPERATE Democratic Senators have failed in their bid to force a vote to overturn Donald Trump’s ‘Muslim ban’ after a single Republican slapped down their bill. 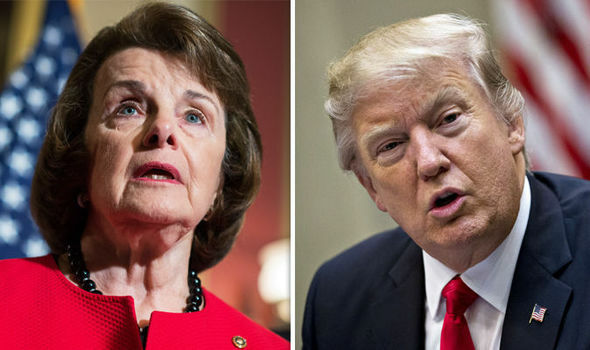 Dianne Feinstein, a Democratic Senator from California, claimed to have 33 other signatures to co-sponsor a bill to rescind the President’s executive order signed on Friday. Yet Republican Senator Tom Cotton was able to block the proposal as Senate rules allows for only one member to prevent a vote. Feinstein tweeted: “Today 33 @SenateDems introduced a bill to repeal President Trump’s discriminatory executive order. Feinstein told the Senate floor on Monday that Trump’s order was “unnecessary, unconstitutional and un-American”. Previous Post Previous Post Germany: Muslim youths rampage outside major shopping center……. Next Post Next Post Bangladesh: Mentally disabled ‘mystic Sufi’ has throat slit by locals…….